It may be the wedding of the year, but little is known about Tuesday’s much-anticipated wedding of Song Joong-ki and Song Hye-kyo, as the pair remain tight-lipped on the details. The couple’s wedding is set to take place at 4 p.m. at The Shilla Seoul’s Yeong Bin Gwan, a Korean-style banquet annex that can accommodate about 300 guests. Only family and close friends will be in attendance, with the media being kept out. There will be no press conference or photo op for the media. While a few details of the ceremony have been made public, the couple previously revealed that there will be no wedding officiant, but that a longtime friend of Song Joong-ki will host the ceremony. Also, singer-turned-musical actress Ock Joo-hyun, Song Hye-kyo’s close friend, will sing for the couple. The two will jet off to Europe for their honeymoon, amid expectations that they will settle down at a residence in Itaewon-dong, Seoul, that Song Joong-ki bought in January. Specific plans for the couple’s honeymoon are yet to be revealed. All eyes are also on who will be attending what is likely a star-studded event. The list of celebrity guests hasn’t been released, but local media have been speculating that actor Park Bo-gum, who shares the same agency as Song Joong-ki’s, and actor Lee Kwang-soo, Song’s longtime friend, are very likely to attend the wedding. Other celebrities expected at Tuesday’s wedding include actor Zo In-sung, who starred in the movie “The Frozen Flower” with the groom, and actor Cha Tae-hyun, who is often described as Song Joong-ki’s lifetime mentor. On the bride’s side, Song Hye-kyo’s close friends, including actresses Kim Hee-sun, Song Yoon-ah and actor Yoo Ah-in are expected to attend, according to media. The celebrity-filled guest list may also include staff, production directors and writers of the hit drama series “Descendants of the Sun,” which brought the couple together. 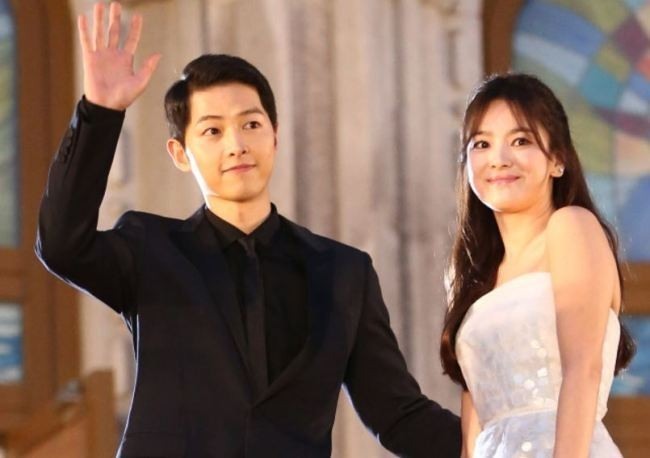 The couple repeatedly denied rumors of a romantic relationship after starring in “Descendants of the Sun” last year, before making a surprise announcement in July that they will be tying the knot on Oct. 31. The couple is reported to have shot their wedding photos in Los Angeles last month. Neither Song Joong-ki nor Song Hye-kyo has revealed plans for after the wedding. Song Joong-ki, who recently starred in “The Battleship Island,” reportedly turned down several projects to spend time with his fiance and prepare for the wedding. Song Hye-kyo, who debuted in 1996 as a model before expanding into acting, hasn’t announced plans for her next project since “Descendants of the Sun.” The couple shared the grand prize at the KBS Drama Awards last year, as well as the award for best couple. The two also won prizes at the Baeksang Arts Awards held in June last year.